Mid-May, South Of France, Thoughts Turn To … Snow? Spring might have already brought unseasonably warm weather France’s way but it seems like winter is still holding on in parts of the country, with snowfall hitting some southern areas on Sunday. Here’s a look at the spring snow in pictures. It’s hard to believe we’re still talking about snow in the middle of May. The three departments remained on orange alert — the second highest warning — for snow and ice on Monday morning, according to France’s national weather agency Meteo France. Here in “Sunny” California, I have overcast sky (for several days running now) and mornings just barely reaching 50 F ( 10 C ). The afternoons have tended to nice, reaching warm enough to run the BBQ and not needing a jacket. It’s just the nights that are still too cool. I’ve been tempted to run the heater in the mornings but have resisted. Opting for jacket and / or thermal blanket (loose knit lots of trapped air warm light blanket). I presently have one draped over me as I sit on the couch, having morning coffee, and contemplating another cold morning. But at least I don’t have to shovel snow. 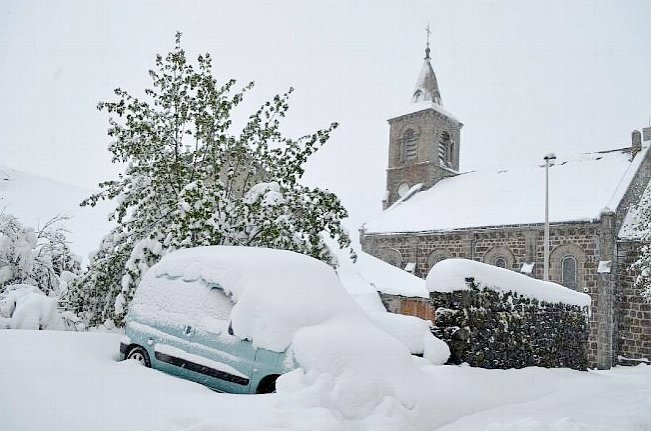 This entry was posted in AGW and Weather News Events and tagged France, May, Snow. Bookmark the permalink. 5 Responses to Mid-May, South Of France, Thoughts Turn To … Snow? We finally seem to have left winter behind. Forecasts are now for 80s (with an occasional bump into the low 90s – typical for this time of year) for the next couple of weeks. April was cold. But with the breezes, now is the time for folks to visit the area – before the humidity spikes during the calendar summer hits us. At least I am not in Southern France. In 1975, Derbyshire were playing a game of cricket against Lancashire in Buxton (in Derbyshire, in the Midlands) a few days before midsummer. Play had to be abandoned for the day when six inches of snow landed on the pitch. Dickie Bird, one of the umpires on this occasion, was (still is) a wonderful character and loved by everyone in the game – even when he was admonishing them on the field. Things happened around Dickie. Every umpire gets to rule that “rain stopped play”, but AFAIK Dickie Bird is the only umpire ever to have ruled that “sun stopped play”. (Someone had opened a roof light on a commercial greenhouse a couple of miles away, and the sun was reflecting straight into the batsman’s eyes, at a low angle.) I do hope his retirement is proving a little less eventful! “Game called on account of sun!” what a great story! Here in SW France we had a hailstorm on Sunday. I’ve been lighting a fire the last few nights, too. Not really what I expect for mid-May here. The start of May was however much nicer and I thought that maybe service was back to normal and we’d have a good year for a change. Since I remember well the headlines from the ’70s telling us we were heading into an Ice Age, I expect we’ll soon be getting those again, and of course it will be because we’re generating too much CO2. It will be interesting to see how the about-face is handled, and the use of memory-slots to change what’s been claimed.